"This recipe was inspired by a similar recipe I received in my produce box from Full Circle Farm in Carnation, WA." In a large bowl, toss cooked pasta with skillet mixture. Sprinkle with feta cheese to serve. I added kalamata olives, zucchini, extra cayenne and extra kale. It was great, but I think it would have been too bland without the olives. Delicious!! Made a few changes -- tossed the dish with Wostershire, black olives and capers. Gave it a richer flavour -- also added more cayenne; we like it spicy. Wonderful recipe!!! Was a great dish and was our first experience using kale. We substituted pasta shells. 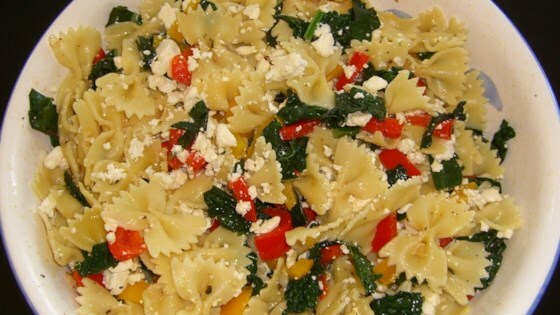 Loved the combination of the pasta, peppers, kale and feta. We used it as a side dish with our baked fish. This was very good, but the kale cooks down a lot, so I suggest quadrupling it to 4 cups. I also suggest putting in only half the recommended amount of feta.